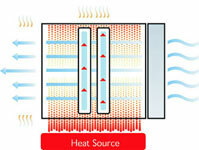 What is Heat Pipe? Why the heat pipe? A Heat Pipe, which is a vacuum chamber consisted of wick structure and working fluid(Water,Acetone,Methanol,etc. ), is hundreds times more efficient heat transmitter than a normal Copper Pipe. dissipate heat from several watts to hundred watts. Good for use in high-powered CPU (3.2G up) heat dissipation. 1U AMD K8 Heat Sink w/2x6mm HEAT PIPE inside.180 degree Horizontal fins, low-noise and high-performance solution. The best 1U solution for AMD K8 Dual Opteron up to XP 3200+ (96W). 1U K8 Opteron Heat Sink w/heat pipe, 90 degree Verticle fins, low-noise high performance solution. The best solution for any 1U high-density w/AMD K8 Opteron CPU. 1U CPU Heat Sink w/2x 5mm HEAT PIPE inside for Intel CPU up to 3.2G. Material:All Copper base and fin . 2U Heat Sink w/Heat Pipe Solution, Copper fins + 3*6mm heat pipe.Low-noise and High performance. Heat sink support up to 120W.